Nice Bag for my 6 year old. Works great so far. What kind of wheels does it have? Hi Jo, this bag has small plastic wheels. What are the dimensions of bag? Great question! The bag will be about 10 X 14 X 20.
how long is extension handle? Hello Jim! The handle extends to about 20 and 3/4ths inches. Can it fit size 12 bowling shoes in inner shoe pockets? Size 12 would fit with no problems. 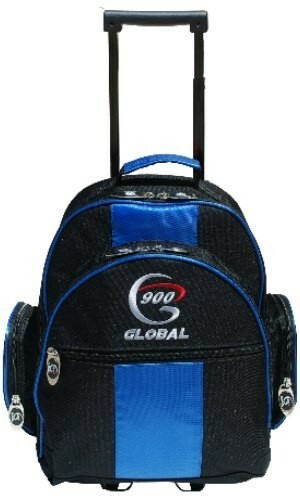 Due to the time it takes to produce the 900Global Value 1 Ball Roller Blue/Black ball it will ship in immediately. We cannot ship this ball outside the United States.